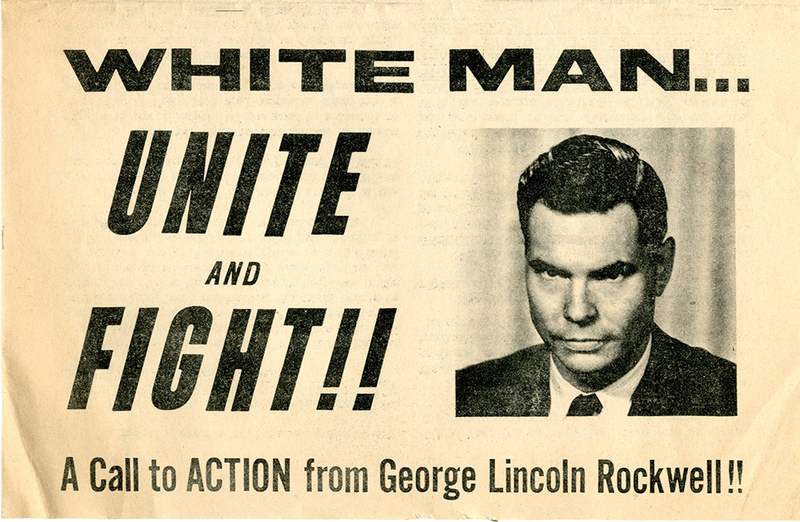 A flyer promoting an appearance by George Lincoln Rockwell, founder of the American Nazi Party, in Richmond, Virginia on July 4, 1963. 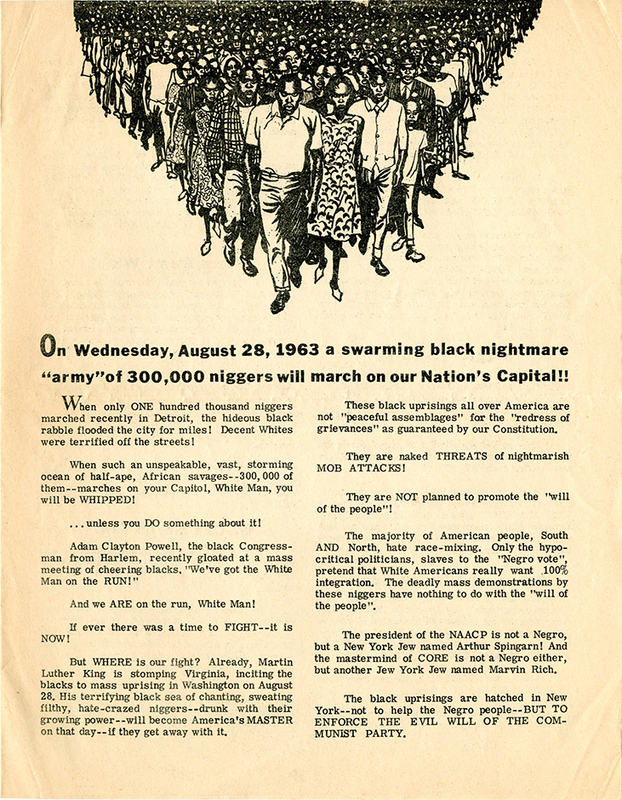 The rally was to intended to motivate opposition to the March on Washington that would take place on August 28, 1963. Rockwell spoke in front of City Hall in Richmond. Rockwell's white supremacist activism was influenced by Senator Joseph McCarthy. Rockwell equated "race-mixing" with Communism. He was also anti-semitic. 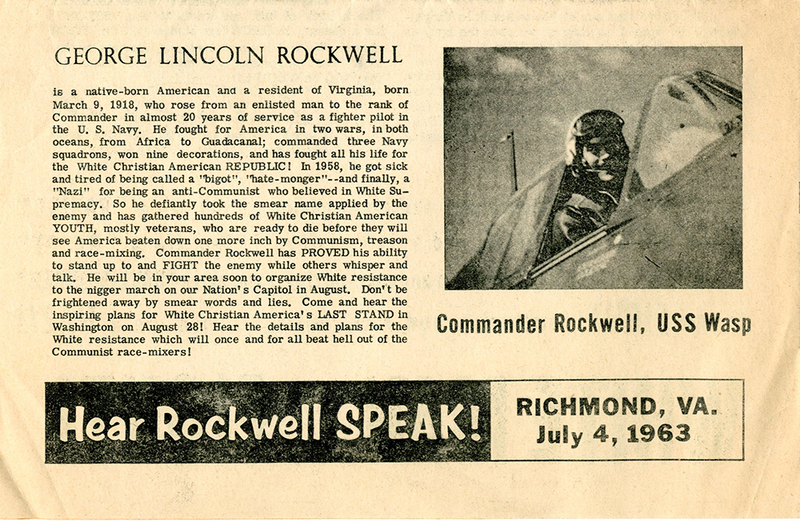 Rockwell ran an unsuccessful campaign for Governor of Virginia in 1965. Mills E. Godwin, Jr. won the governorship with 296,526 of the 562,789 votes cast. Rockwell received 5,730 votes, coming in fourth behind Godwin, A. Linwood Holton, Jr. and William J. Story Jr.
Rockwell was murdered in 1967 by a recently expelled member of the American Nazi Party. This flyer was folded in half for distribution. The two half-sized images appeared on the outside. Once opened, there were three full-sized pages of text inside. 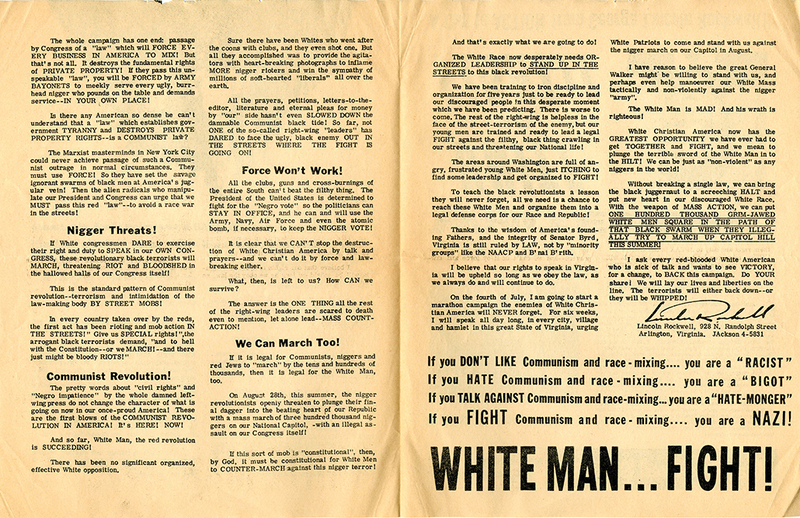 “George Lincoln Rockwell, Richmond, Va., July 4, 1963 [publicity flyer],” Social Welfare History Image Portal, accessed April 26, 2019, https://images.socialwelfare.library.vcu.edu/items/show/249.